I’ve recently been out to one of my favourite race circuits for a shoot with the epic 1971 Ferrari 512M. 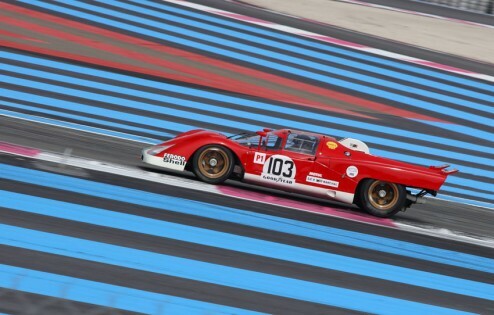 Circuit Paul Ricard is set in the mountains at Le Castellet behind Marseilles in the South of France and is reminiscent of Laguna Seca in California with its mountain air and clarity of light although the track is flatter and more open. Dramatically painted run off areas highlight the corners and the atmosphere in the paddock is typically Prevencal with a long break for ‘Dejeuner’ always scheduled into the program. I arrived at dawn and woke Tim Samways’s transporter driver who sportingly agreed to unload the car for me to start shooting statics in the creamy early light.Track time was arranged between 12-1.00pm but the car only arrived in the pit lane at 12.50 pm giving us only enough time for just one lap for car to car photography…which was sufficient. Just fifteen 512Ss were converted into M spec in 1971 and with over 600bhp on tap through the quad cam five litre V12 engine…we tiptoed our way around the track, the glorious song of the Italian race tuned V12 the only noise shattering the silence of the important procession of lunch.